Property 7: 5 Star living in a Brand New 2 Bedroom Apartment! A Little Piece of Paradise ~ private suite in secluded garden setting, WIFI etc. Property 13: A Little Piece of Paradise ~ private suite in secluded garden setting, WIFI etc. This place was a true gem. We loved our stay here. It was so cozy and we felt like we were in a mountain cabin. Beautiful property with everything we needed. 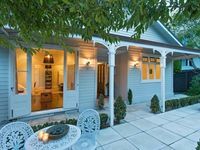 Close to Newmarket shops for retail therapy &amp; Parnell rise for eateries. Ideal for a larger group, I will definately keep this property in mind for future stays. The only small improvement would be a later check out time. 10 am is a rush with a bigger group, especially with teenagers. It would be nice to have an 11 am or 12 noon check out option. I would have happily paid a small fee to have a more leisurely departure time.